Hello, podcast listeners! We are back with another edition of the Sound and Fury podcast, in which I sit down with cool people and have an angry chat. Episode 18 features actor Randall Park, our good friend who you may recognize from a bunch of movie and TV projects over the years, including Veep, Supah Ninjas and The Interview. Next, he stars in the new sitcom Fresh Off The Boat, which premieres February 4 on ABC. Thank you to all the regular listeners who have downloaded and subscribed to the podcast thus far. I love making this show, and I'm just happy that people are enjoying them. To catch up on previous episodes, check out the archive. To stay up-to-date with future episodes as soon as they drop, be sure to subscribe. You can also find Sound and Fury on services like iTunes and Stitcher, where you can rate and review the show. 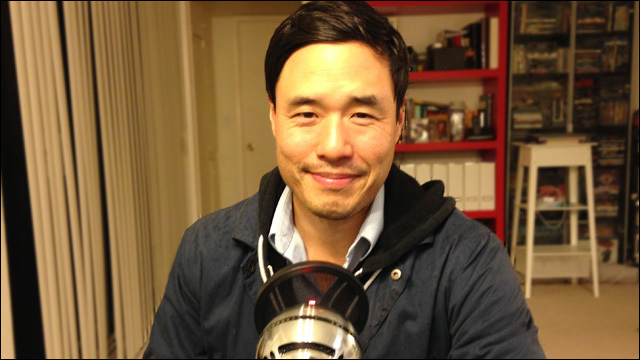 In episode eighteen, I talk to actor Randall Park about the complications of playing a North Korean dictator, the pressures of starring in the only Asian American family sitcom on network television, and that time he cast his baby daughter as a crime-fighting cop. Fresh Off The Boat premieres with two episodes on Wednesday, February 4, then settles into its regular timeslot on 8:00/7:00c Tuesday, February 10 on ABC. If you haven't seen it, here's the trailer for Fresh Off The Boat. Randall has been in a lot of things. Here's his IMDb profile. See some of Randall's early work in the hilarious short film Dragon of Love, directed by Doan La and written by Michael Golamco. You may recognize Randall as "Asian Jim" from The Office. Check out Randall's page on Channel 101, where you can watch two of my favorite Randall Park joints, The Food and Baby Mentalist (also starring Randall's wife Jae and daughter Ruby). Also see Randall as the amazing Ronny Nishimoto in "Workout Tape." Read about that awkward "chopsticks" moment during the TCA's Fresh Off The Boat panel. Big thanks to Randall for taking the time to hang out. Special thanks to Sabzi for providing the music in this episode. And as always, huge thanks to all of you for listening. If you like the show, please share it and tell your friends. To stay on top of future episodes and updates, be sure to subscribe. Stay Angry.